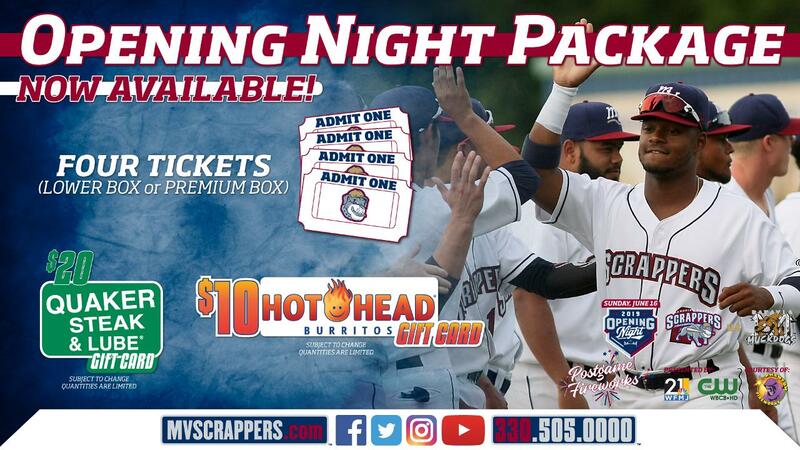 NILES, OH - The Mahoning Valley Scrappers are pleased to announce the Opening Day ticket package for the 2019 season. The package includes four tickets to Opening Night on Sunday, June 16, a $20 gift card to Quaker Steak & Lube and a $10 Hot Head Burritos gift card. Following the game fans will enjoy a fantastic fireworks show presented by 21 WFMJ and WBCB courtesy of Phantom Fireworks. Opening Day packages are on sale now and start at just $44. Packages are limited to the first 100 purchasers. They can be purchased by clicking here, at the Chevy All Stars Box Office at Eastwood Field or by calling (330) 505-0000. The Mahoning Valley Scrappers are the Short Season Single A Affiliate of the Cleveland Indians and play all home games at Eastwood Field. Notable alumni include CC Sabathia, Victor Martinez, Francisco Lindor, Jose Ramirez and Jason Kipnis. For more information about single game tickets, ticket packages or group outings visit mvscrappers.com or call the front office at (330) 505-0000.